The Trinidad and Tobago national football team has only managed a top two CONCACAF finish once in its history when the “Soca Babes” finished runner-up to Mexico to qualify for the 1991 Portugal Under-20 World Youth Championship. 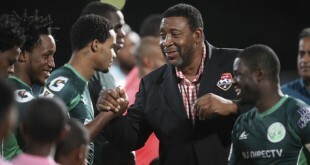 Angus Eve, Trinidad and Tobago’s all-time most capped senior team player, was a key member of that gifted squad and he is hoping that history repeats itself in the United States, next month, as the young “Soca Warriors” aim to book a maiden Olympic Games berth. T&T face Mexico, Panama and Honduras on March 23, 25 and 27 respectively with the top two teams advancing to the semi-final stage. The last two nations standing will advance to the London 2012 Olympic Games, this July. “The team is trying to do something we have never done before,” Eve told Wired868.com, “which is to qualify for an Olympics. It is not going to be an easy task but I have a dedicated group of people behind me. 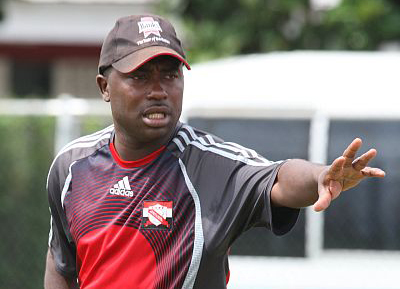 Trinidad and Tobago football legend and Eve’s former teammate, Dwight Yorke, was an inspirational part of the 1991 youth team, which became the first local side to qualify for a FIFA tournament. Yorke was an employee of English top flight club, Aston Villa, at the time And Eve hopes that some overseas-based know-how can again provide the winning edge to a promising outfit. The United States-based quartet of Kevin Molino, Sean De Silva, Bradley Welch and Kevan George are already in the frame for selection. Eve is crossing his fingers regarding the availability of the Europe-based trio of Khaleem Hyland, Mekeil Williams and Robert Primus as well. Hyland, who broke into the senior team as an 18-year-old, four years ago, is a versatile midfielder with European Champions’ League experience for Belgian top flight club, Genk. He played alongside the nucleus of the present Olympic squad at the 2009 Egypt Under-20 World Cup and Eve is anxious to secure his services. Talented Trinidad and Tobago midfielder Khaleem Hyland (left) holds off former England striker Dean Ashton during a friendly international senior fixture. “We have to been trying to get him for the longest time,” said Eve. “The tournament does not fall on a FIFA date but we are trying to make (Genk) understand how important this is for our country. Primus’ availability is uncertain too albeit for a different reason. The central defender has not played competitively for seven months since reconstructive surgery on his knee last year and only just started light training. Eve hopes to have him ready within four weeks. Primus’ agent, Dion Sosa, feels the chance of the Kazakhstan-based defender being match fit for the Olympic qualifiers is slim. But Eve is adamant that the Aktobe player will have every opportunity to prove his fitness. Eve has already accepted defeat on another score. Deep-lying midfield playmaker Leston Paul, who captained the under-20 team in Egypt, and attacking left-sided midfielder Nick De Leon—the son of ex-national star Leroy De Leon—will not wear “red, black and white” in March. 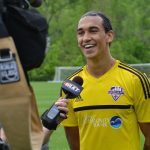 De Leon, who was born in Arizona and was recently drafted by MLS team, DC United, applied for a Trinidad and Tobago passport and had been in talks with the under-23 staff. However, the talented 21-year-old player decided against representing his father’s homeland at this time. Eve feels that the instability surrounding the Trinidad and Tobago Football Federation (TTFF) might have spooked De Leon. The TTFF was recently denied FIFA funding due to its inability to account for aid money meant for Haiti while it is struggling to meet financial obligations to the 2006 World Cup squad. Paul, according to Eve, did not respond to numerous requests to join the squad and that too was a decision the coach will respect. His loss might open the door for Tobago-born defensive midfielder Kevan George, who moved to Atlanta as a 12-year-old and was just drafted by MLS outfit, Columbus Crew. Eve’s former mentor and the 1991 Under-20 World Cup head coach, Bertille St Clair, recommended George and he will get a chance to prove his merit. Defender Mekeil Williams, who recently left W. Connection for Polish First Division club Pogon Szczecin, is expected to link up with the squad in Miami too while ace midfielders Molino and De Silva have cemented spots. The national under-23 squad is in impressive form and followed up a 9-1 spanking of Suriname, in its last Caribbean qualifier, with successive friendly wins against Finland and Guyana. Several youth team players will be included in the senior squad that travels to face Antigua next week. The Caledonia AIA strike pair of Jamal Gay and Trevin Caesar, Connection left winger Joevin Jones and Jabloteh utility player and under-23 captain Sheldon Bateau have conjured up particularly notable performances in 2012. Eve intends to concoct an unforgettable blend from the available talent. And what about Jake Thompson? Why hasn't his name even been mentioned?? ?